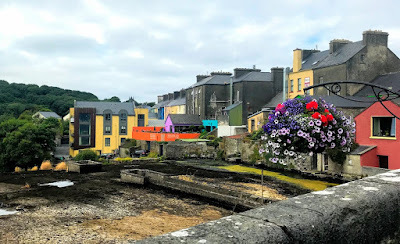 On our journey through the Burren on Saturday afternoon, six of us passed through a number of pretty towns and villages in Co Clare, including Ennistymon, Lahinch, Ballyvaughan, Doolin, Corofin and Kilfenora. On a bright, sunny, summer’s afternoon, one was as bright and colourful as the next, sometimes with colours that were reminiscent of towns and villages in Tuscany under Italian summer sunshine. Ennistymon, a market town built on the borders of the Burren and on the banks of the River Cullenagh or River Inagh, combines scenic, natural beauty with old world charm and many traditional pubs. The narrow street near the bridge over the Cullenagh River is the oldest part of the town. Behind the Main Street and a little below the seven-arch bridge, built in 1790, the river with its small rapids rushes over an extensive ridge of rocks, creating a beautiful cascade. The official name of Ennistymon is Ennistimon, although the spelling Ennistymon is used most widely, and historically it was spelled Inishdymon. The oldest part of town is the narrow street near the bridge. Ennistymon grew from just three cabins in 1775 to 120 houses in 1810. The Falls Hotel, formerly Ennistymon House, is a Georgian house built ca 1760 on the site of an earlier castle. A Church of Ireland parish church, with a nave and chancel, was built in the Ennistymon in 1778 by the Ven James Kenny, Archdeacon of Kilfenora and Rector of Ennistymon. Saint Andrew’s, a new Gothic Revival parish church with an octagonal tower, was built in the 1830s. The church became a hall when it closed in 1989 and is now Teach Ceoil Saint Andrew’s. A mile outside Ennistymon, the ‘An Gorta Mór’ Memorial near Ennistymon Hospital, stands in the grounds of the old local workhouse, and remembers the Great Famine of 1845-1850. The West Clare Railway once passed through Ennistymon, connecting the town with Ennis and with towns and villages on the West Coast of Clare. The railway station opened on 2 July 1887, but closed on 1 February 1961. Earlier that afternoon, we drove through Lahinch, a small resort close to the head of Liscannor Bay. Lahinch is beside a 2 km long beach of golden sands on the north-west coast of Co Clare, between Milltown Malbay and Ennistymon. The shape of the resort creates Atlantic breakers that attract surfing and canoeing enthusiasts from all over the world and Lahinch has earned a reputation as a top ‘surf centre.’ It is also a centre for sailing, swimming, kite surfing, skin-diving, and deep-sea and fresh water fishing, and is known for its 18-hole world championship course at Lahinch Golf Club. The marshes north of the town are home to a wide variety of terrestrial, freshwater and marine birds. Lahinch is said to take its name from the Irish An Leacht or Leacht Uí Chonchubhair, meaning ‘The Memorial Cairn of O’Connor.’ Another version of the name in Irish, found in the Annals of the Four Masters, is Leath Inse, meaning ‘half island’ or peninsula, which describes the location of the village between the Inagh River and the sea. In the Middle Ages, the O’Brien clan dominated the coastline. Liscannor Castle and Dough Castle are now ruins. The tower of Dough Castle stands on the golf course, and O’Brien’s Bridge across the Inagh River is in the vicinity. As late as the 18th century, Lahinch was still a small hamlet with only a few fishermen’s huts. It grew in the 19th century to over 1000 people by 1835, but it was not until later in the century that the infrastructure of the town developed and it became a seaside resort with the opening of the West Clare Railway in 1887. In 1883, the town was struck by a severe storm that destroyed the sea wall and promenade and damaged many buildings. Local governor William Edward Ellis oversaw the repair work that followed, and the construction of a new sea wall and promenade was inaugurated by Lady Aberdeen, wife of the Lord Lieutenant of Ireland. The West Clare Railway closed in 1961, but Lahinch retains its popularity and in recent years has become a renowned surfing location. Although the town has been known as Lahinch since the 1850s, in recent years many of the road signs were erected in the area, changing the spelling to Lehinch. The name change began when the National Roads Authority – now the Transport Authority Ireland – took responsibility for road signs. The NRA asked the county council to put together a Place Names Commission so that it could correct misspellings and typos in the area, and Lahinch, Ennistymon and Corofin became Lehinch, Ennistimon and Corrofin. Now these three towns in Co Clare want local plebiscites to correct the misspelling of their names on all official since 2011. Local groups have started the legal process of changing the names of their towns. Local people in Lahinch took matters into their own hands, correcting the spelling on a number of signs. Ennistymon and Lahinch both mentioned in some versions of Percy French’s song ‘Are Ye Right There Michael.’ The song, written by Percy French (1854-1902) in 1902 and parodying the state of the West Clare Railway, was inspired by an actual train journey in 1896. Because of a slow train and the driver stopped for no apparent reason, French, though who had left Sligo in the early morning, arrived so late for an 8 pm recital that the audience had left. The ballad caused considerable embarrassment to the rail company, which was mocked in music halls throughout Ireland and Britain. The company took a libel action against French. When French arrived late for the libel hearing, the judge chided him on his lateness. French reportedly responded, ‘Your honour, I travelled by the West Clare Railway,’ resulting in the case being thrown out. And it drags you to sweet Corofin. And the fire’s tee-totally out! ‘Are ye right there, Michael? Are ye right? Kilkee! Oh you never get near it! It spends most of its time off the track. ‘Are you right there, Michael, are ye right?